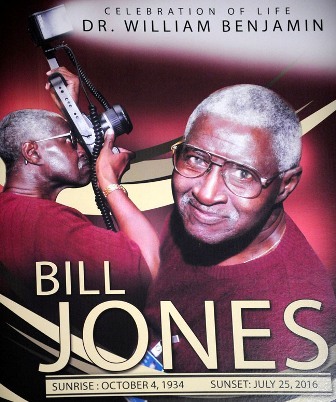 Legendary photographer Dr. William Benjamin “Bill” Jones, who captured Hollywood’s most iconic and luminous African American celebrities for decades, was memorialized on July 14, 2016 at Holman United Methodist Church in Los Angeles. Jones, 83, passed away while in hospice care on June 25, 2016 after a long bout with Alzheimer’s disease. Numerous tributes poured in for the beloved photographer, whose career spanned 50 decades. President Barack Obama sent a proclamation in honor of Jones’ stellar legacy, as did Congresswoman Maxine Waters, Los Angeles Mayor Eric Garcetti, county Supervisor Mark Ridley-Thomas, state Senator Holly Mitchell, councilmembers Mike Gipson and Curren Price, Jr. and City Council President Herb Wesson. Born Oct. 4, 1934 in Mansfield, Ohio, Jones first picked up a camera while serving as a sergeant in the U. S. Air Force. He became interested in photography while stationed in England, where he studied at the London School of Photography. He snapped his first celebrity photo of Cassius Clay, (who later changed his name to Muhammad Ali) in 1966 when Clay traveled to London for a return match with heavyweight Henry Cooper. After retiring, Jones moved to Los Angeles in 1972. He attended California State University Los Angeles and received a master’s degree in business, but his real goal was to photograph celebrities. Jones was long recognized as a pioneer who helped to break barriers for black photographers in Hollywood. In the competitive world of celebrity photography, Jones frequently had to jostle other paparazzi to secure a spot on the red carpet, but his open, friendly manner and Midwestern charm soon had many black celebrities posing for his lens such as Denzel Washington and Halle Berry. “Being the only black photographer, other black actors and actresses would come to me and let me take whatever pictures I wanted,” Jones is quoted as saying. During his illustrious career, Jones’ captivating photographs were regularly splashed across the pages of Ebony and Jet magazines as well as publications such as Right On, Sister 2 Sister, the L.A. Watts Times, The Wave and L. A. Focus and the Los Angeles Sentinel. His pictures of countless celebrities included Quincy Jones, Oprah Winfrey, New Edition, James Brown, Whitney Houston, Magic Johnson, Eddie Murphy, Muhammad Ali, Bill Cosby, Michael Jackson and Sidney Poitier as well as historic photos of the Rev. Dr. Martin Luther King, Jr. and Nelson Mandela. Jones’ career was momentarily cut short in 1997 when a neighbor brutally attacked him with a baseball bat, leaving him in a coma for a month. Several concerned celebrities whom he had photographed over the years rallied to pay his hospital bills. Despite the setback, Jones remained undeterred and returned to the red carpet. Dozens of family, friends and colleagues gathered at Holman to pay their respects in memory of the iconic photographer, whose ashes, mingled with the remains of his wife, Reva Ochier, who passed away in 2011, were displayed in a blue urn on the church podium. Recognized by his colleagues as a “kind and giving” man, Jones generously mentored many African-American photographers during their careers. April Sutton, who was the first entertainment reporter at Black Entertainment Television (BET), remembered Jones’ giving nature and generous spirit. Sutton recalled the evening when Jones deftly snapped the ionic photo of Denzel Washington and Halle Berry after they both captured Oscars for “Best Actor” and “Best Actress” at the 2002 Academy Awards. ”We talked about that historic, magical moment for many weeks,” Sutton said. She also recalled when she and Jones covered the 1984 Grammy Music Awards at the Shrine auditorium when “The King of Pop,” Michael Jackson, posed back stage holding eight Grammys. “Bill got the shot. That night was amazing,” she recalled. Jones’ pastor, the Rev. Paul Hill of Grace United Methodist Church who delivered the invocation, pointed out that Jones was a long-time faithful member of the sanctuary. Jones’ sister-in-law Katherine Gould humorously recalled that Jones, whom she called “WB,” was a very loving and kind man, but that he could also be “stubborn.” “I liked to debate with WB—but he always won the debate,” she recalled fondly. Granddaughter LaToya Jones, who was raised by Jones, recalls, “We grew up watching our grandfather work the red carpet. We helped to develop his pictures and he taught my little brother Marquis Jones how to use a camera. He always made sure that his business affairs were in order and I admired how he turned his passion for photography into a business,” said LaToya, who plans to carry on her grandfather’s legacy as a celebrity photographer. Jones passed away peacefully while holding his first grandchild’s hand. His remains were placed in the wall of the Veteran’s Memorial in Riverside, California on July 18, 2016. He leaves behind his daughters Michelle and Natalie Jones and seven grandchildren, including LaToya and Marquis Jones, Tandika and Cherelle Hayes, Antoine and Andre Leach, Kiana Jones as well as seven great grandchildren with two on the way. He is survived by his siblings Ruth Foster, Booker Jordan and Betty Jordan of Gary, Indiana as well as a host of nieces and nephews, friends and colleagues.